The UA3149A series “pop-type” relief valves are especially designed for use as a secondary relief valve in carbon dioxide transports and stationary storage tanks. 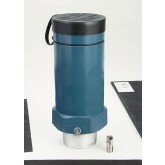 The relief valve is designed to protect the tank from excessive over pressure in the event of fire or other emergencies. A small throttling-type primary relief valve must also be provided to control boil-off and maintain tank pressure. Provisions must be made to prevent the accumulation and build-up of water and foreign material in the valve. • “Pop-type” design permits the relief valve to open slightly to relieve moderately excessive pressures. • Relief valve “pops” open to full discharge capacity when pressure exceeds a predetermined point.